5. Joey (Matt LeBlanc) buys Chandler a flashy bracelet (The One with the Prom Video). 5. Monica (Courteney Cox Arquette) can no longer hide the Big Secret (The One Where Everybody Finds Out). DVD: Standard 1.33:1; audio English Dolby Digital 5.0; subtitles English, French; closed-captioned; single sided - dual layered; Not Rated; 302 min. ; $34.98; street date 12/19/00. Supplements: Never-before-seen Footage; Music Video; 2 Behind-the-scenes Featurettes; Cast Career Highlights. Okay, I admit that I can be ever-so-slightly quick to judge at times. Such was the case when Friends hit the air back in the fall of 1994. The show rapidly became a huge hit, but I thought it was smug, cutesy 20-something pap. Did I actually watch the program to come to these conclusions? Uh, no, but I didn’t need to - you could just tell it stunk by osmosis! For reasons I can’t recall, I eventually started to check out Friends after a few years, and while some of my initial impressions remained correct - the show does seem a bit precious at times, and I could live without its soap opera elements - I gradually came to enjoy the experience. Friends isn’t classic TV, but it’s a generally amusing and well-executed program. In defense of my early knee-jerk dismissal of the show, Friends clearly had come a long way by the time I started to watch it. Those first couple of seasons really weren’t particularly good, as it took some time for the actors and the writers to really get to the heart of the characters. However, that’s not unusual, as most long-running TV programs don’t find a real groove until they’ve been on for a few years. That rule seems to apply mainly to comedies because they’re generally more dependent on character development and performer chemistry and timing than are dramas or other forms of TV entertainment. Comedies focus less on plot and more on character reactions to situations, so it’s very important that the participants develop a sense of unity and clear ideas for their roles. That takes time, and that’s why Friends is much better today than it was six years ago. One can see some of that progression in the various episodes collected on the two Best of Friends DVDs. Each includes five shows, though technically we should consider the discs to offer six programs since each DVD offers one double-length piece. On Volume One, the episodes start with the 1994 “Pilot” and progress through season two‘s “The One With the Prom Video” from February, 1996; three of the shows are from the first season, while the other two come from season two. Volume Two begins with season three’s “The One Where No One’s Ready” (broadcast September, 1996) and progresses through season five’s “The One Where Everybody Finds Out”, which appeared in February, 1999. One of these shows is from season three, while two each are from seasons four and five, respectively. Without question, the episodes on Volume One are less entertaining than the later programs. The “Pilot” is probably the worst of the bunch, and its appearance makes sense only for historical reasons. On this show, we see how the gang came together. Actually, we don’t learn the whole genesis of their friendship, as five of the six characters already hung out together, but we do learn how Rachel (Jennifer Aniston) came to reunite with high-school buddy Monica (Courtney Cox) and then became part of the crew. The “Pilot” isn’t a bad episode, but it seems rough and awkward compared to later shows. It also stands out negatively in regard to its continuity. Later in the series - as demonstrated in “The One Where Ross Finds Out” - it becomes an important plot point that Rachel never knew that Ross (David Schwimmer) had the hots for her. However, at the end of the pilot, he tells her that he used to have a crush on her and then inquires if he could later ask her out on a date. Since I haven’t seen every episode of the show, I don’t know if this was ever explained within the context of Rachel’s apparent later revelations, but I guess they just pretended this part of the “Pilot” never happened. The other four episodes on Volume One are better than the “Pilot”, but they provide inconsistent laughs and entertainment. “The One With Two Parts” aired in February 1995, and as the title implies, it was their first two-part episode. The program has its moments, but it feels a little too showy. It took in some guest stars such as George Clooney, Noah Wyle and Helen Hunt; oddly, the latter reprises her role from Mad About You but although the first two play doctors, they aren’t their characters from E.R.. Perhaps there was some copyright issue involved, but it seemed odd nonetheless. In any case, the addition of the guests felt gratuitous and cutesy. Bringing in name actors is a touchy issue for a show like this. Sure, The Simpsons makes it work, but there it’s much easier for the participants to blend in since you don’t see them and you’re less aware there’s a big star behind the voice. When Bruce Willis pops up on Friends, it’s exceedingly difficult to forget that it’s Bruce Willis. Tom Selleck meshed nicely, and I liked Susan Sarandon’s recent turn on the show, but otherwise, most of he guest stars have come across as awkwardly-inserted on the show, and “The One With Two Parts” felt like everyone tried too hard to make it an “event”. “The One With All the Poker” from March 1995 rebounds somewhat, mainly because it nicely demonstrates the evolution of the characters. Monica’s intense competitive streak starts to creep into the show, and we learn more about Ross’ love for Rachel. It also includes some good comic moments as the female characters horn in on the guys’ poker game. Sure, it’s a bit sexist, but those elements aren’t excessive, and it’s ultimately probably the best episode on Volume One. From November 1995, “The One Where Ross Finds Out” has some good moments, but it seems like too much of a soap opera episode. Ross has been dating Julie for a while, and the relationship starts to deepen: they’re going to buy a cat together. Rachel - who found out weeks before that Ross had a thing for her - has developed her own feelings for him, and she finally lets this news out to him here. Thus starts their own ill-dated relationship. The show has a few funny bits, but it seems to appear mainly for its importance within the character development scheme. The final Volume One episode comes from February 1996. “The One With the Prom Video” features something that would become a popular recurring bit: the flashback scenes. Here we get a look at Ross, Rachel and Monica circa 1987 as the two women prep for their senior prom. I believe this show offered the first look of “fat Monica”, and it’s probably popular for that reason alone. Actually, it’s a decent episode that seemed pretty entertaining, though the flashback motif would become a bit tiresome in later years. While the shows on Volume One are definitely watchable, it’s on Volume Two that we discover some really good stuff. Easily the best of the bunch is the first episode, “The One Where No One’s Ready” from September 1996. Although I’ve seen this one a number of times, it remains absolutely hilarious, and I laughed much more than usual during it. Ross has an important dinner party to go to, and all of the gang are coming with him. He needs to be there on time, but each of the other five obsesses over various issues that causes them to dally. The multiple storylines blend together cleanly and the result is a terrific episode that seemed funny from start to finish. From January 1998, we get “The One With All the Embryos”. Here we learn that Phoebe (Lisa Kudrow) has agreed to have her sister-in-laws embryos implanted so she can have their baby. That aspect of the show seemed a little cutesy, and it didn’t help that the ever-annoying Giovanni Ribisi played Phoebe’s brother Frank. However, the other storyline featured a debate that pitted Monica and Rachel versus Joey (Matt LeBlanc) and Chandler (Matthew Perry) against each other. Each side thinks they know the others better, so Ross concocts a quiz to decide the matter. That part of the show provides some terrific laughs, mainly through the questions, but also due to the actors’ reactions; by this time, they all clearly felt very comfortable in the roles, and that let the material succeed. “The One With Ross’s Wedding” comes from May 1998 and it offers the second two-part episode. Here we move to his impending nuptials with British chick Emily. Frankly, I think they made Emily English just so they’d have an excuse to move the show to the UK for an episode; it’s no coincidence that this “special” show appeared during a sweeps period. This one features more than its fair share of soap opera elements, as Rachel has to confront her continued affection for Ross, and Monica and Chandler hook up for the first time. It provides some amusing bits as well, but it seems to be included here mainly for the many character revelations. We get more flashback fun during “The One With All the Thanksgivings”. Here we learn why Chandler hates the holiday, and most of the crew relate various Turkey Day disasters. The majority of the episode revolves around more Eighties-style escapades, though these add Chandler to the mix with Ross, Rachel, and Monica. As a whole, it’s a funny little piece, although the whole flashback motif started to seem a little thin. Finally, February 1999’s “The One Where Everyone Finds Out” has some moments, but it’s another show that seems to make the cut due to its character revelations. Monica and Chandler have been dating for some time, but they don’t want their buddies to know. Of course, this fact slowly begins to become apparent, and the various characters try to use their knowledge - or their knowledge of the other side’s knowledge - to play pranks. These scenes are modest fun, but it’s not one of the better episodes. The soap opera elements of Friends point out a flaw of these DVDs. From the “Pilot” to “The One Where Everybody Finds Out”, we cover a span of 111 shows of Friends. A lot changed within the characters, their circumstances and relationships over that span, but the DVDs only offer a brief snapshot. Supporting characters appear and disappear, as do various themes and plot points. What happened to Marcel the monkey? Where did Julie come from? Who’s Richard? This issues and many others will confuse anyone who comes to the DVDs cold; if you don’t already know the stories, you’ll probably get lost along the way. Not that the shows can’t be funny and entertaining in their own right. Frankly, I don’t know how tough it’d be for a newcomer to digest these shows. After all, this isn’t the X-Files or a true soap opera; those kinds of programs require concerted knowledge to make much sense. Friends probably can stand alone pretty well, but the lack of continuity likely would be frustrating for anyone without prior knowledge of the show. As such, it’s kind of hard to establish to whom Warner Bros. is trying to sell the DVDs. The “Greatest Hits” motif makes it appear that they’re for casual viewers, but the lack of continuity puts those folks at a disadvantage. On the other hand, the episodes will only make sense to more serious fans, and since each show includes added footage - more about that later - the package does appear to be aimed at that crowd. However, those partisans aren’t fond of the “sampler” style and would prefer sets of whole seasons. As a result, both Volume One and Volume Two of The Best of Friends are watchable but less than terrific compilations. I’m not a die-hard fan of the show, but I watch it consistently and I know enough about it to make sense of these stand-alone episodes. Even so, I felt frustrated by the format, mainly because I quibbled with most of the choices. A couple of the shows were genuinely terrific, but others seemed mediocre at best. I was happy to see these unedited programs but I’d still prefer a more coherent release. 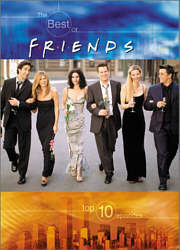 Friends appears in an aspect ratio of approximately 1.33:1 on these single-sided, single-layered DVDs; due to those dimensions, the image has not been enhanced for 16X9 televisions. Although the shows always seemed watchable, the episodes looked surprisingly muddy and weren’t as clear as they should have been. Sharpness was a definite concern. At best, the picture presented a reasonably accurate image, but I never thought it appeared especially crisp or detailed. Instead, the shows usually seemed mildly hazy and dull, without much clarity. Some shimmering and jagged edges appeared as well. Apparently Friends is shot on film, and some source flaws emerged. I saw mild grain throughout most of the shows, and I also detected occasional speckles and a few streaks. Colors almost always looked bland and drab. The hues maintained a muddled, brownish appearance during most of both DVDs, and while all colors showed problems, skin tones suffered the most. They alternated between excessive pinkness and a flat brownish look; both of them seemed unnatural. Black levels were a bit gray and blah, and shadow detail showed similar characteristics. Some of the more recent episodes of Friends displayed slightly greater sharpness, but not to any consistent degree; in fact, the London-based story - which appeared in 1998 - is one of the ugliest of the bunch. The episodes on The Best of Friends never appeared horribly unattractive, but I found the bland and fuzzy picture to be a disappointment nonetheless. While the remastered Dolby Digital 5.0 soundtrack of The Best of Friends definitely outdid the picture, it presented a fairly restricted presence. However, I won’t complain about this, since it’s not like Friends provides a slew of opportunities for stellar sonics; it’s a quiet, dialogue-driven show, and the audio emphasizes that fact. Music spread adequately to the side forward speakers, and it also emanated gently from the rears. Otherwise the track often seemed to be essentially monaural. The laugh track presented a moderately involving presence from all five channels - though mainly from the front - and some mild ambiance also came from the sides and the rears. For example, one restaurant scene showed light “clinking” sounds, and a rainstorm during one episode seemed surprisingly engaging. During “The One With All the Thanksgivings”, Phoebe’s flashbacks also offer fairly active surrounds, with a nice amount of warfare heard in the rears. Nonetheless, this is a very modest mix, and appropriately so. Audio quality was decent but unspectacular. Dialogue generally sounded distinct and natural, but some edginess interfered at times. However, I never noted any problems related to intelligibility. Effects varied mildly but they usually came across as reasonably accurate and realistic, and they showed no signs of distortion, although the laugh track occasionally seemed rough. Music was the strongest component of the mix, as the rock score sounded fairly crisp and demonstrated pretty solid bass response. The high end periodically seemed a little flat, but for the most part, the music was clear and tight. Ultimately, Friends offered too modest an auditory experience to merit anything above a “C+”, but it nonetheless was fairly satisfying. While The Best of Friends doesn’t provide a slew of supplements, we do find a few extras here. Most significant are some snippets that have been added to each of the episodes. On average, I believe that a typical broadcast show of Friends lasts 22 minutes, but each of these programs pads out that length. The shortest is “The One With All the Thanksgivings”, which clocks in at 22:40, while the “Pilot” easily lasts longest at a whopping 29:20. The others average between 23 and 25 minutes in length; the two double-episodes run 47:45 (“The One With Two Parts”) and 49:35 (“The One With Ross’s Wedding”). Although I’d seen most of these shows prior to my exposure to the DVD, I don’t know them well enough to detect most of the additions. This factor was aided by the editing, which seamlessly integrated the clips into the full product; I challenge anyone to find differences between old and new material. In fact, these episodes moved very smoothly as a whole. Unlike most programs shot for TV - such as the mini-series Nuremberg - cuts for commercial breaks were handled neatly. At times those moments were apparent, but they never seemed abrupt or obvious, and this made the shows flow quite effectively. All told, we find about a half an hour of new material in these 10 episodes, and the crisp presentation made them work especially well. Available on both DVDs are “Cast and Crew” listings. We find entries for the six main actors plus producers Kevin S. Bright, Marta Kauffman and David Crane. The bios are decent but unspectacular, and they often appear a bit incomplete. Some of them discuss enterprises completed during the run of Friends, but others omit this information; Matt LeBlanc’s career seems to have halted in 1988! In addition, both discs include the music video for the show’s theme song, “I’ll Be There For You” by the Rembrandts. This clip reminds me why I initially disliked the program. The cast cavort on the set of the video shoot and ham it up with band members. It’s a cutesy affair that is more fun if you like the show, but it still got on my nerves. Exclusive to Volume Two are two short “behind the scenes” programs, both of which relate to “The One With Ross’s Wedding”. “Friends goes to London” (six minutes, 15 seconds) and “Friends On Location In London” (two minutes, 15 seconds) are almost interchangeable. The longer piece adds a little more detail about the cast and crew’s experiences in England, and it also reveals the motivations for the trip, but it includes lots of show snippets, which pads out its length. The shorter bit omits TV clips, but it has some parts that are redundant with the other program. Both are pretty superficial and don’t tell us much, though they’re watchable and moderately entertaining. Both DVDs purport to include some DVD-ROM content, but those materials are very limited. The “Online Events” links to the Warner Bros. Video web page. I found no mention of Friends on this site; actually, it doesn’t appear to have been updated for almost a year! We also find a connection to the official Friends website, while other links include ones to the WB Studio Store, WB Home Video, and WB Online. There’s also a “DVD Sampler” which simply lists a slew of WB titles and mentions their features; unlike some of these “Samplers”, no trailers or other bits seem evident. Although I used to loathe Friends, I gradually came to embrace it, and I enjoyed most of the episodes found on these DVDs. To my eyes, I definitely preferred the shows offered on Volume Two; they were consistently funnier and more entertaining. The episodes on Volume One were generally good but they didn’t match up with the later shows. Unfortunately, both DVDs share the same mediocre picture and sound quality, and they lack many extras. On the positive side, each of the episodes has footage edited back into it, and this makes for a fun presentation. While I’d prefer whole seasons of Friends, these packages remain entertaining and are worth a look for fans of the show. Note that these two DVDs can be purchased either on their own or as part of a 2-disc “Gift Set”. The latter encloses the two discs in a nice keepcase, and it also lists for about $5 less. On their own, the volumes retail for $19.98, while the “Gift Set” goes for $34.98. If you want both DVDs, the latter is clearly the way to go.